Recently I took some time off work for surgery and did some reading to occupy myself as I had weeks of limited movement. This involved looking through the ridiculously long book lists I’ve cultivated through our local libary system’s online tool and you know, actually reading some stuff I’d forgotten why I’d listed in the first place. Quiet: The Power of Introverts in a World That Can’t Stop Talking had caught my eye when it was first published in paperback in 2013 (though it debuted in 2012) and at the time thought it was an interesting title but not necessarily a blockbuster in my own vein of interest (full disclosure: as a writer and trained graphic designer I totally suffer from knee-jerk title and cover judgement. Hey, we’re all human. ), so it wasn’t until a month ago I thought well, I’ve got lots of time to fill so let me give this a shot. I’m not in the habit of proclaiming much as “life-changing” or “life-affirming” and indeed, I’m a bit wary of things once I hear those terms attached as being over-rated. 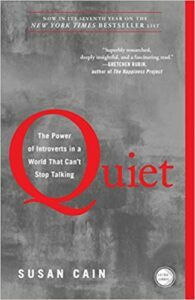 But I would definitely say that Susan Cain’s study of what makes an introvert an introvert and an extrovert an extrovert and why we need both in equal amounts was certainly identity-changing for me. As Ms.Cain points out through various study results and anecdotes, the social culture in the U.S. is currently one that favours extroversion and not only places less value on introversion but sees it as threatening to our successes in both our private, business and social lives. Taking the reader from the early 1920s when the terms “extrovert” and “introvert” were introduced into American psychology, Ms. Cain enlightens us to the major shift in American focus from a culture of “character” where one’s morals and contribution to the community were paramount and all-defining to a culture of “personality” where individual popularity and gain took the forefront, leading the way to the “me-first” culture we are indoctrinated in today and the rest of the world defines us by. It’s a very interesting, “only in America” sort of story that sheds a lot of light on why well-meaning parents for decades have seen “being a little shy” in their children as a hindrence at best and a psychological problem at worst that needs to be addressed and eradicated. Indeed, because of this aversion that I certainly grew up with, I never saw myself as an introvert at all. I knew I wasn’t particularly an extrovert either, which left me in the no-man’s land of not belonging in either camp. For years I just didn’t know what was wrong with me and as an adult I’d just tried to accept I didn’t fit in anywhere, But Ms. Cain takes away the judgement statements in very clear language and defines what an introvert is and why the particular characteristics of introversion work well with the characteristics of extroversion. Lo and behold, many great leaders and majorly successful business owners in the U.S. and beyond have been introverts. Ms. Cain takes us through what studies have shown as the “magic mix” of both types of people for success as well as gives us the tools to figure out how to work with our innate tendencies in order to maximize our success in life while not beating ourselves up for not being showy enough or forcing ourselves to be someone we are clearly not. My big takeaway was this: Hello, I’m Rose and I am an introvert. And I can now make it work whereever I am and with whatever I do. Quiet: The Power of Introverts in a World That Can’t stop Talking is available in multiple formats on Amazon.com and you can read a preview HERE.